AccountMate continues to improve the software while being mindful to the user needs; and such is the case in the latest version. 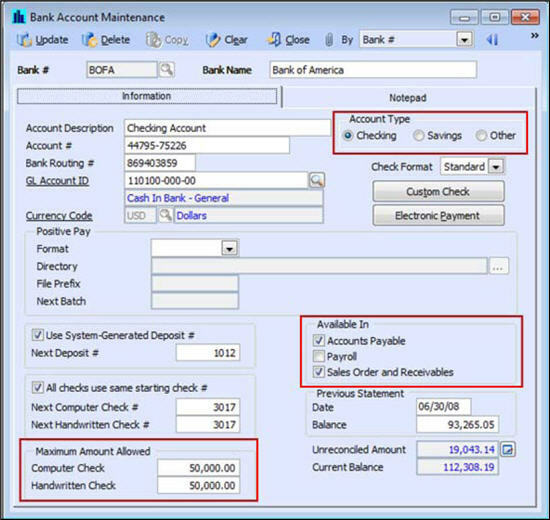 In AccountMate 8, there are enhancements implemented in Bank Account Maintenance that will allow better viewing capability and easier access to information. 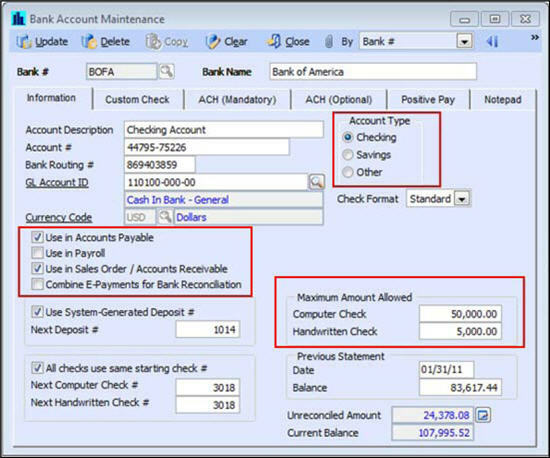 This Technical Note discusses the Bank Account Maintenance enhancements in AccountMate 8. This document also shows the differences between the AccountMate 8 and 7 Bank Account Maintenance. 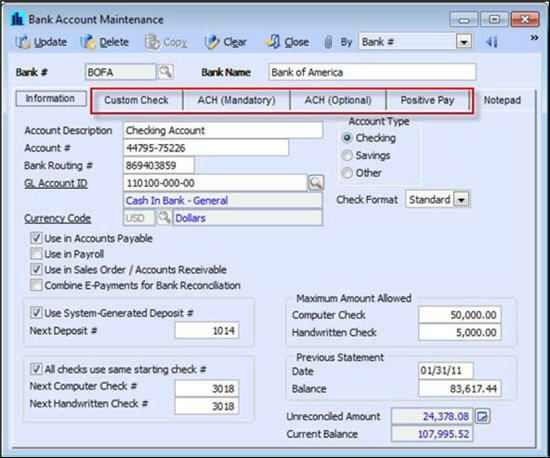 In AccountMate 7, you can set up a custom check, a positive pay file, or an electronic payment in the Bank Account Maintenance > Information tab. 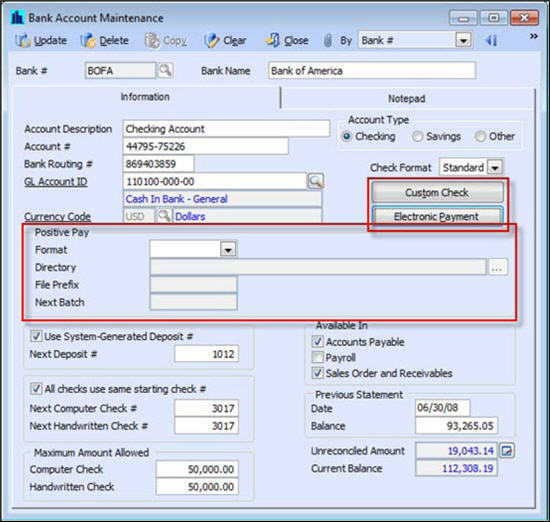 Now, in AccountMate 8, each setup has an assigned tab and the electronic payment (ACH) setup is split into two tabs: ACH (Mandatory) and ACH (Optional). Below are the screenshots that highlight the differences between AccountMate 8 and 7. The Positive Pay Directory field length is increased from 366 to 384 characters. Note that the positive pay feature is not available in AccountMate for LAN (AMLAN); thus, users who upgraded from AMLAN may refer to Article Understanding the Positive Pay Feature for more information. All the MICR Line fields must have an assigned segment or none. You cannot save the changes and you will encounter a message “MICR Line Position [x] is empty” if at least one of the MICR Line fields does not have a specified segment. An MICR line segment can only be assigned once. You cannot save the changes and you will encounter a message “Duplicate segment in MICR printing sequence is not allowed” if an MICR line segment is assigned to more than one MICR Line fields. In addition to the separate tabs for the ACH mandatory and optional settings, below are the other enhancements to the electronic payment setup. The Directory field length is increased from 304 to 384 characters. The ACH (Mandatory) and ACH (Optional) tabs are not accessible if electronic payment is not set up in the AP module. “ACH directory has not been entered” This message appears if the ACH file Directory field is empty, but the File Prefix and Next Batch fields are not empty. “ACH directory does not exist” This message appears if the ACH file Directory field is not empty, but the directory’s location does not exist. “ACH next batch has not been entered” This message appears if the ACH file Directory exists, but the Next Batch field is empty. The File Prefix field must not be empty or it must not contain any illegal characters (i.e. /:?*”|). The enhanced Bank Account Maintenance feature also shows some rearranged and renamed fields. The Available In field is now Use in [modules], the Maximum Amount Allowed section is moved to the lower right section, and the Account Type options are now arranged vertically instead of horizontally. Another major enhancement is the E-Payment for Bank Reconciliation which, when activated, causes AccountMate to combine electronic payments during bank reconciliation. Refer to Article Understanding the Combine Electronic Payments Feature for further discussion. Below are screenshots that highlight the changes in the Bank Account Maintenance > Information tab between AccountMate 8 and 7. The discussion above guides AccountMate users to easily find in the latest version the fields and setup functions to which they have been accustomed in the lower version. Knowing the enhancements in the Bank Account Maintenance will allow users to maximize the function to its fullest potential. This information is provided "AS IS" without warranty of any kind. AccountMate Software Corporation ("AccountMate") disclaims all warranties, either express or implied. In no event shall AccountMate be liable for any damages whatsoever including direct, indirect, incidental, consequential, loss of business profits, or special damages, even if AccountMate has been advised of the possibility of such damages.